Galenique Studio, offered by PTI, Inc., is modular and customizable software that can be used as a tool by the pharmaceutical scientists working in the area of analytical, pre-formulation, formulation and process development. Galenique Studio is consisted of a single module or combination of several modules. The number, use, extend of customization, as well as the programming techniques vary depending on the ultimate use of the software as well as the type dosage form for which the system will be utilized. For example, module deals with troubleshooting the modern Film-Coating Processes, and provides insight into the major film-coating problems that plague the pharmaceutical industry today. Another module, is a useful tool for predicting the weight, density and force variation for a given formulation running at a specific, (i.e., clients’) bilayer tablet press, as well as for training the pharmaceutical scientists in this area. 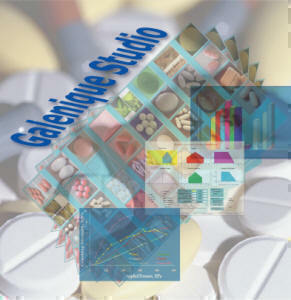 While each module of Galenique Studio can be independently used to meet the need of the client in a specific area of interest, integration of several modules can turn Galenique Studio into a powerful expert system that can be utilized for the purpose of recommending solutions, trouble shooting, training, etc., during the development of pharmaceutical dosage forms. Why would a pharmaceutical scientist need a tool such as is Galenique Studio? Preformulation studies represent the first step in the rational development of all pharmaceutical dosage forms. It is a well known fact that physico-chemical and mechanical properties of pharmaceutical materials dictate how formulations will behave during manufacturing and ultimately perform as a drug delivery system. Main objective of Preformulation studies is to generate information on those properties that will be useful to formulation scientists in developing stable, robust, and appropriately bioavailable tablets that can ultimately be mass-produced. That is where INFORMex, the most basic module of Galenique Studio becomes an extremely useful tool for the pharmaceutical scientists. It is also common in formulation development studies that the formulation scientist may have extensive knowledge of the active ingredients that are to be formulated (say into a tablet form) and yet still needs to know which excipients to select, and their proportions. At this stage, a knowledge based, so called “expert system”, can be helpful to the scientist in selecting suitable excipients.. The outcome of the recommendations may heavily depend upon the drug release properties of the final dosage form as specified by the scientist. Another case where such an expert system could be off use in formulation studies is the determination of the design space for manufacturing conditions. During the preformulation studies and subsequent formulation and process development phases of a product, immense amount of data are collected and recorded usually in the laboratory notebooks or computers. Unfortunately in many cases no further subsequent utilization of these data and or the imbedded knowledge is possible or practical unless some sort of data management tool is used. That is where a modular form of Galenique Studio becomes an indispensable tool. Please note that we also offer other customized expert systems such as Immediate and Controlled Release Formulation Expert Systems, or Extended Compaction Analysis Programs, as well!